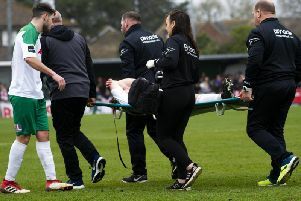 Bognor boss Jack Pearce has bolstered his injury-hit squad for the campaign run-in by bringing in two new recruits ahead of the Bostik Premier division game against Leatherhead. Striker Reece Myles-Meekums has come in on loan from National League outfit Bromley until the end of the season and promising young left-back Ashton Leigh has also signed. Both players are in contention for a place in the side to face the Tanners at Nyewood Lane tomorrow. The defender plays for Wessex League side Baffins Milton Rovers, who are managed by his dad, former Rocks' favourite Steve Leigh. Myles-Meekums, 20, started his career with Brighton's academy side, moving to Bromley last year. He has had spells on loan this season at both Worthing and Eastbourne Borough. Pearce and coach Robbie Blake are delighted to have captured the talented duo and their arrival eases the injury woes that have at times hindered progress this season. Who's out and who's about for the Rocks? He said: "Reece has plenty of potential and has a good pedigree and he certainly got fans excited at both of his loan spells already this season. “With Joe Tomlinson still injured, Ashton joins us as cover and it allows us a chance to run the rule over him moving forward. He has been on our radar for some time. We're looking forward to working with both players as we try to get back in to the play-off positions and, of course, with an eye on the Sussex Senior Cup semi-final against Brighton coming up, too." Emergency ward Bognor: who's out and who's now about?